An iridescent-colored box that resembles a ? Block. Item Boxes are boxes found in the Mario Kart series. Item Boxes look like ? Blocks but are transparent and often multi-colored, and in more recent games they have a iridescent checker board pattern. When a character passes through them, they will get a random item. These blocks also appear in Mario Tennis and Mario Power Tennis. They have appeared in all the Mario Kart games, except Super Mario Kart where they used ? Panels instead. Fake Item Boxes appear as an item from the real item boxes, and can be used in a similar way to Banana Peels but has a bigger impact by making racers flip over instead of spinning out. As seen in Toad's Factory in Mario Kart Wii, Item Boxes can be made out of Brick Blocks. The position players are in a race determine what kinds of items they will get. For example, someone in first place may get a Green Shell or a Banana Peel, while someone in last place may get a Star, three Mushrooms, Lightning, or a Bullet Bill. 1.1.3 Mario Kart: Double Dash!! Mario Kart 64 is the first game to utilize Item Boxes, replacing ? Panels from Super Mario Kart. Instead of being flat, square, and yellow like ? Panels, they have an octahedron shape with a ? in the center, and are multicolored. Colliding with an Item Box will provide the character with a random item; the item received is determined based on the place of the character - the farther back they are, the more powerful items they will get. Unlike ? Panels, Item Boxes respawn almost immediately after being used. Throughout the game, there are two item boxes with the unusual characteristic of providing nothing but Spiny Shells; they are marked with a sideways "?" and appear hanging from the Luigi Raceway balloon and atop a large rock on Koopa Troopa Beach. Item Boxes take on a different appearance in Mario Kart: Super Circuit. Here, they look like cubes that change color instead of their previous octahedron shape. Most are found in groups of 3 but some boxes are isolated in uncommon locations in the track. Other than appearance and location changes, no functional changes have been made. The Double Item Box, which first appeared in Mario Kart Double Dash!! In Mario Kart: Double Dash! !, Item Boxes make a reappearance, along with a new variety named Double Item Boxes. Unlike regular Item Boxes, Double Item Boxes grant both the driver and the thrower items. Item Boxes in Mario Kart Double Dash!! take on a different appearance from their previous appearances: they are still shaped like cubes, but they have a checkerboard texture, similar to a race flag. Double Dash!! is the first game where Item Boxes can move independently around the track - some in Mushroom Bridge or Mushroom City will follow the track like the other cars, while some in Peach Beach or Sherbet Land will move back and forth along a piece of track. Moving Item Boxes respawn where they were last broken, except in Mushroom Bridge and Mushroom City, where they respawn in the pipe shortcut and in alleyways, respectively. The player's screen will turn black if they enter the alleyways in Mushroom City. In split-screen mode except for Battle Course stages, Item Boxes are brighter checkerboard texture than the normal checkerboard texture. In the mini-game Bob-omb Blast, Item Boxes and Double Item Boxes only grant players the Bob-omb item, and have their "?" replaced with a Bob-omb to show this. Any Double Item Boxes are replaced with single Item Boxes when a Mario Kart: Double Dash!! course appears in a later game. Item Boxes in Mario Kart Arcade GP and its sequel serve the same function. However, they are depicted with a honeycomb-like hexagonal structure instead of cubic. In Mario Kart DS, the boxes have a similar appearance to the boxes in Mario Kart Double Dash! !, being slightly more square with white borders and including transparent areas, and serve the exact same function. Like in the previous games, they still grant the player an item depending on the player's place. 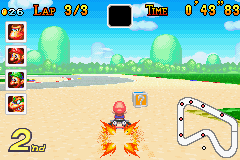 In the Mission Mode of Mario Kart DS, the player's task occasionally is to destroy a certain amount of Item Boxes (which often contain Mushrooms to give the driver a boost). In DK Pass, there is an item box sitting on top of a large hill that acts rather unusually. It will give the player, no matter what place they are in, a Star, Triple Mushrooms, a single Mushroom, or (rarely) a Red Shell. It is sometimes referred to as a "Super Item Box". This is the only location of such in the entire game, but it also appears in missions where the player must beat someone else (like Yoshi, a Chain Chomp or a red car). In multiplayer battle mode, defeated players have an unlimited supply of item boxes (though there is a delay time for each use) and can deploy them similar to a banana. These help other players get items. The ghost item boxes disappear after a while. 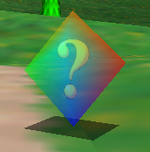 In Mario Kart Wii, the item boxes lose their checkerboard textures and gain rainbow dot textures. They act in a similar manner as in the previous games and nothing has been changed relating to function when an item is received. However, they do reappear at a slower rate than its precedents. It is seen that Item Boxes are created out of normal Brick Blocks in Toad's Factory. The concept of a "super" item box returns only in the battle mode stage, Chain Chomp Wheel. There, some item boxes float in the center of a large ring, bearing in shape of a star. If players can aim correctly and touch the item boxes, they mostly receive a Star or the occasional Mushroom. 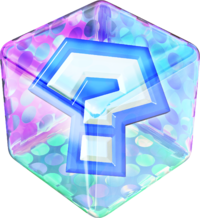 In multiplayer modes, Item Boxes have spinning question marks inside them as opposed to being static in single-player mode. Description: "Usually found strung out in a single line across the track, Item Boxes contain all of the Power-Ups, offensive and defensive items that make the Mario Kart series so interesting and enjoyable. From Bananas to Bob-ombs, don't miss your chance to hit an Item Box because you're definitely going to want what's inside. And if you use the Items to your advantage, they'll help you win!" Game Tip! : "Item Boxes aren't always found in obvious locations. On some tracks you'll find them being pulled behind moving objects. Grab them anywhere you can!" Item Boxes return in Mario Kart 7 with the same design and purpose as Mario Kart Wii, with a rainbow-colored texture slightly less biased against the red area. Unlike in Mario Kart DS, they do not appear on the bottom screen's map. While the "super Item Box" of DK Pass remains intact, the Spiny Shell-only Item Boxes from Luigi Raceway and Koopa Troopa Beach have been replaced with a regular Item Box and a Coin respectively. Item Boxes reappear in Mario Kart 8, holding the same function as in previous encounters. The appearance remains about the same from Mario Kart 7, except it is a crystalline grey instead of a rainbow color and the ? is a little bit bigger. 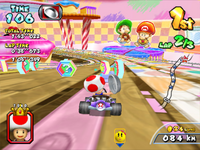 One difference between the games is that players can no longer hold two items at once (like in Super Mario Kart), and items will appear in the drivers' hands (like in Mario Kart: Double Dash!! ), or in the case of the triple items and the Crazy Eight, automatically activate by themselves. Unlike previous games, it now has a new sound effect, for both the Item Box itself and the item roulette. In Animal Crossing, there are Item Boxes after the glider segment that are held up by balloons, which can be obtained by either gliding through the Item Box or by breaking the balloon. The Item Boxes in certain stages have special sound effects from their respective games, as opposed to the normal sound; Animal Crossing's play a variant of the music when a profile is loaded or saved, Hyrule Circuit's play the chest opening jingle from The Legend of Zelda games, and Urchin Underpass's play the stat slot sound from Splatoon. Mario Kart 8 Deluxe features the return of Double Item Boxes. Like in Double Dash! !, players can once again hold up to two items at once, even if they do not drag the first item. However, unlike in Double Dash! !, the second item is merely held in reserve while the first item is in play. An Item Box appears in Super Smash Bros. Brawl, as a Sticker. It increases ice attack power by eight. The artwork shown in the sticker is from the Mario Kart: Double Dash!! version of the Item Box. Item Battle mode in Mario Power Tennis. Item boxes are only used in the two games, Mario Tennis for the N64 and Mario Power Tennis and the former can only utilize item boxes in a certain stage. They both have similar functions to each other and to the Mario Kart series as they will both give the player an item when hit, which is in this case, hit by the tennis ball. They both give similar items as seen in the Mario Kart series; even as far as having the same sound effects of Mario Kart Double Dash!! in Mario Power Tennis. Item Boxes appear in the Dream Race event in both versions of Mario & Sonic at the Olympic Games, as well as the Dream Platform event that appears exclusively in the Wii version and the Dream Canoe, Dream Shooting and Dream Long Jump events in the Nintendo DS edition, taking their design from the more recent Mario Kart games. The items that can be obtained from these boxes vary depending on the event being played and which version of the game it is played on. In the most-to-all Dream Events in Mario & Sonic at the Olympic Winter Games, item boxes are used. They, like in the series they debut in, give the player an item if the player happens to run into the item box. However, the Item Roulette cannot be stopped too early, unlike the past Mario Kart series of games and the item does not depend on the current ranking of players. Item Boxes in Bowser's Shocking Slipup. Item Boxes make an appearance in the minigame, Bowser's Shocking Slipup in Mario Party: Star Rush. Here, depending on the timing hit, they can deliver Lightning Bolts to Bowser or cause Banana Peels to spawn, which can stun players. Double Item Boxes appear and give out twice the number of items. During the second phase of the battle, Item Boxes spin faster. Double Item Box, Mario Kart: Double Dash!! This page was last edited on March 5, 2019, at 21:00.